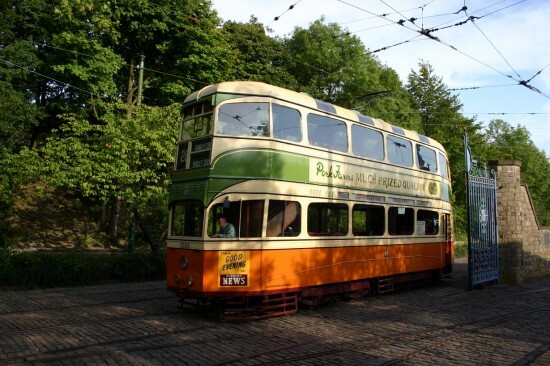 The Scottish Tramway and Transport Society have launched an appeal to raise funds for the full restoration of Glasgow Coronation 1282 at the Crich Tramway Village so that it can once again return to the operational fleet. At last September’s Glasgow 50 celebrations with the publicity surrounding the return to Glasgow blue route colour livery of 1068 it was expected that the appearance in service of 1282 would just be added bonus but as it turned out the Coronation stole the show! As a result of this the STTS have decided that they will attempt to raise the funds – currently estimated to be £150,000 – so that 1282 can once again turn heads at the home of the National Tramway Museum. at Crich with an arrival date given in the excellent “Destination Crich” book of 24th March 1963. Despite the fact that the tram had been operated right until the end at Glasgow it was not to actually operate in passenger service at Crich until 1978 following workshop attention over the previous year. It remained part of the operational fleet until 1985 after which it required some further attention in the Workshops, it received this in 1986 and was back in service the same year. The tram had another stint in the Workshop in 1996 and remained in service until 2003 when it was withdrawn with more drastic attention required. This time, though, there was not to be a quick fix and 1282 ended up sitting out of the limelight for nine years before it was resurrected for the Glasgow 50 celebrations where it proved to be a star of the show and people started to yearn for its return to a more permanent role in the operating fleet. As the predecessor of the STTS – the Scottish Tramway Museum Society – was the original sponsor of 1282 it was decided that they would set up a fund specifically to return the tram to the rails at Crich and the “STTS Coronation Appeal Fund” was formally launched at the monthly meeting of the group on Friday 11th January 2013. The fund has already been boosted by monies raised through the sale of the “Destination Crich” book by Wim Beukenkamp which was launched at the Glasgow 50 event last September. Donations have also already started to come in including a very symbolic amount of £1282 from a Life Member of the STTS. The STTS have liaised with the Tramcar Sponsorship Organisation, who themselves have a lot on their plate at the moment, and Crich are also aware of their intentions to raise the monies required for the restoration. Alternatively you can make payments using PayPal through the official STTS website (http://www.scottishtransport.org) and clicking on “Appeal Fund” for instructions (although at the time of writing this is not yet available). You can also use the attached donation form and send it to the above address. This form also has all the required details to make a donation using Gift Aid which is a vital tool for charities. With the London County Council Tramways Trust also currently in the process of raising funds for the major restoration of London County Council 1 it looks as though it could be an exciting few years in the Workshop at Crich. This is great news, there’s only streamliner working currently at Crich so another would be brilliant. Would it be sensible to restore 1297? Hasn’t it been working recently?